Digitization of back-office function is most talked about topic these days. Almost every business has enabling functions i.e. finance, human resources, and IT. Leaving behind few exceptions these enabling function runs in similar fashion. For instance, Loan application processing, insurance claim processing are some of the most rule driven tasks within financial services. As per the research done by industry analysts Automation of shared services operation can bring huge benefits in terms of cost savings. Redundant and false incidents consumes lot of time and resources. Expensive Automation Platforms – Development platforms i.e. 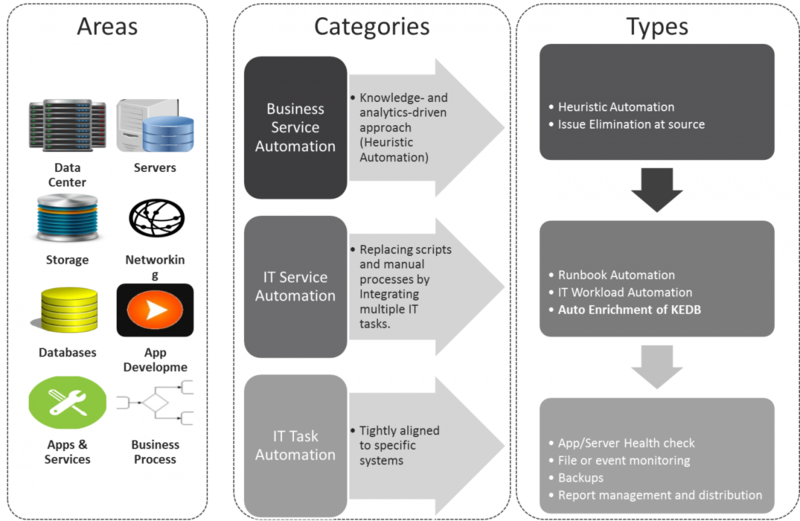 Automation Anywhere, Blue Prism, UI Path are expensive and are not proficient to cater all the Automation requirements. Incident remediation’s and monitoring activities: Factory based approach for resolution of rule based Incidents & SRs – Most of the L0 and L1 type of ticket and daily monitoring activities can be addressed through auto remediation. Incident remediation and monitoring activities can be leveraged through IT Task automation, IT Service Automation and Business Service Automation. Heuristic Automation: Problem Management and Performance management falls in Level 2 incidents. Through advanced automation techniques (NLP and Machine Learning) we can find the root cause of the Problem and quick action can be taken. Issue elimination at source: Through this approach there is high possibility to reduce ticket volume as most of the issue are acknowledged and remediated at source. Automation monitoring tools foresee the futuristic problem (space crunch, password expire, timeout etc.) and predictive analysis. Through this approach issues get mitigated before they get converted into alerts/incident. Auto Enrichment of KEDB: As per this approach KEDB is provisioned with auto enriching feature. This tool record resolution steps for future reference and present them to user through smart UI. Integrated Dashboard reporting: This approach provides holistic view of multiple department/systems to the stakeholders along with predictive analysis for better decision making. Free up resources – Resources can be utilized for strategic IT initiatives, instead of spending time on repetitive time-consuming tasks. FTE can be reduced by automating repetitive SOP driven tasks through Auto- Remediation, Self-healing & Self Service. Improved SLA- can be implemented to expedite the team’s activities to restore services which improves operational efficiency.